I have found the best way to look younger is to identify all the things you do (or don’t do) that age you and make you look older. Once you know which of your habits are working against you, you can start taking steps to become younger looking and preserve your youthful looks. Looking younger naturally is simply caring for yourself in ways that will take years off your appearance and make you look younger. So, if you're wondering how you can look younger without surgery, read on for my top 10 ways of looking younger below. Slow down your aging process. Most people are concerned with their external appearance and any visible signs of aging but the aging of your skin does not exist in isolation from the aging of the rest of your body. In order to look younger naturally you must give your skin the vitamins and minerals it needs to rejuvenate. Slowing down the aging process requires controlled sun exposure, little and often, not enough to cause sunburn or skin damage but the right amount of sunlight to trigger your body's own natural production of Vitamin D. Vitamin D deficiency should be avoided if you want to look younger. Understand how and why skin ages. The fact that your skin makes up 15% of your body weight makes it the largest organ in your body. Understanding skin structure and how and why skin ages is one of the first steps towards younger looking skin and rejuvenating older skin. How healthy and youthful your skin looks not only depends on the condition of your epidermis layer but also on how well your skin can absorb and retain moisture. Skin that naturally retains water well has a plumped up youthful appearance as apposed to older skin which is dryer and more prone to wrinkles. Sun tanning will age you. Whereas the right amount of sun exposure can help you to look younger with tawny, glowing, healthy skin, too much sun will do your skin irreparable damage. The aging effects of sun tanning deplete your body of vitamin B. Prolonged sun exposure, year after year, is responsible for both premature aging of the skin and many skin cancers. To look younger, protect your skin from harmful UV rays. Feed your skin with youth promoting vitamins. Some vitamins will help to give you younger looking skin. Vitamin C helps to fight against wrinkles and fine lines by producing collagen. Vitamin E helps the skin look younger by protecting it from UV rays and also by eliminating harmful free radicals. You can knock years off your age by simply changing your diet and feeding your skin. Roses help you look younger. Rose Water nourishes and hydrates your skin. Mature, older skin is toned and rejuvenated. Rose Water is also used for smoothing wrinkles and restoring the vitality and moisture balance of facial skin. Beauty skin care with Rosehip oil delays the effects of skin aging, aids cell regeneration and boosts collagen and elastin levels. Through this action, it slows down premature aging and helps reduce the formation of wrinkles and reduces scarring. Take regular exercise. Keeping fit and active with regular physical fitness exercises will do wonders for your health as well as making you look and feel better. As you grow older it will help you to stay young looking and you will feel great for it. We judge someone’s age by his or her overall appearance and the way they move so if you want to look younger naturally keep your body fit and supple. Lose weight. You can make yourself look years younger if you slim down and reduce the amount of fat cells in your body. Carrying excess body weight will put stress on your internal organs and increase the risk of weight related diseases. If you are overweight, then significant weight loss can make you look years younger. Not only that, you will feel healthier, live longer and avoid all the weight related diseases as you grow older. Use anti aging vitamin supplements. The surface of your skin is forever changing as your body carries out natural skin rejuvenation all by itself. For younger looking skin you can help this natural skin rejuvenation process by giving your body specially formulated antioxidants like vitamin E and coenzyme Q10 to supplement the amount that is naturally present in the skin cells. Look after your hair. When it comes to looking younger, there’s no denying that your hair plays an enormous role. A head of healthy, soft, shiny hair is an instant morale booster and will make you look years younger too. Your hair should be your crowning glory but unfortunately too many women abuse and damage their hair. Coloring, perming, straightening and bleaching all take their toll on your hair’s natural condition and vibrancy but with the correct hair care you could have a gorgeous head of hair. Grow Strong Healthy Fingernails. When attempting to look younger, many women forget their hands; aging hands can ruin the overall effect of your youthful looks. Keep a bottle of hand and nail cream next to every tap and basin in your house and use it after every time your hands come into contact with water. If you apply the cream while your hands are still damp you will help to trap in the moisture. This will help you grow strong healthy fingernails and keep your hands soft and young looking. 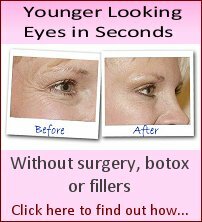 Whether you suffer from permanently tired looking eyes, droopy or sagging eyelids, or even deep set eyes then this clever little celebrity beauty secret can give you a wide eyed youthful look in just seconds. The skin rejuvenation process is the process of reversing many visible signs of aging so you can have younger looking skin. Skin rejuvenation can diminish wrinkles and lines on older skin as well as firm loose and sagging areas, leaving you with noticeably younger looking skin. Forehead lines are not always a sign of age. Indeed, deep lines on your forehead can happen at any age, even some people in their 20's develop forehead lines and they are often caused by the facial expressions you use the most. These are called expression lines. Because your face is exposed to the environment all the time it will age long before the skin on your body. However, there are some things you can do to slow down the aging process and preserve your youthful looks. Oil of Olay Beauty Fluid was the first beauty moisturizer I ever used and I began using it 38 years ago when I was just seventeen. When I was seventeen I had combination skin which frequently broke out in teenage spots and using any heavy or greasy moisturizer was out of the question for me.